What do you mean, I'm late? We're only like 4% of the way through the year! It's still new! And it's that time of year again. The time of year again when blogs contain things like this and this... posts about ways to start a Bible reading plan and stick to it. I've done the same myself from time to time, and we've even got some Bible reading plans available at ScriptureMenu.com if you want to get your toes wet. It's the time of year for "resolutions," and judging from the number of weight loss/dieting/exercise/stop smoking ads I've been getting in my mailbox and seeing on TV, resolutions are still alive and well. If you've been following this blog for a while, you will know that I'm on an on-again, off-again quest to read all the way through the Bible. In fact, I am planning to do it all in one year. That year is 2010, so I am officially starting my third year of my one-year Bible reading plan. I faltered a little bit that year when we had some family situations that basically disrupted our lives for several months; at the end of the year I renewed my commitment to keep at it. And I did keep at it... for a while, at least! I wound up getting stuck at the end of the book of Jeremiah, not because Jeremiah was a particularly hard book, but because this summer we moved to a new town and I ran into an intense spot at work that often left me drained at the end of the day. To make things worse, the new place is a bit smaller (we'll be moving into a bigger house soon), which means it's a little bit harder to get away from the racket of having a 4-year-old and an 11-year-old in the house. Basically, it got hard, so I never officially "quit" reading, but I sort of just didn't continue reading consistently. You know what? I can see the effect that it had on me when I was reading consistently, and I can see that it's not there now. I'm convinced: just reading the Bible consistently really does change you for the better. It's not just something that the Bible publishers say to get you to buy Bibles, and it's not just what your pastor says because it's his job; it's a reality. And listen, this blog is certainly not my job. I don't get any dollars or brownie points for saying this. It's the honest truth. My good friend Justine blogged a few weeks ago about her failure to follow her Bible reading plan last year to the letter (or the number... make sure you check out her post if you're a math nerd like she is!) But actually, she didn't call her experience a failure, and I don't either. Time in the Word is never a failure, even if it's not as much time as you had planned. I don't really do the "resolution" thing, but now is as good a time as any to get back on the horse and ride... so last night I opened my Study Bibles back up to where I left off. I almost laughed when I realized I was picking up at maybe the least popular book in the whole Bible! I mean, even Leviticus isn't as not-popular as Lamentations. At least Leviticus is part of the Pentateuch, and everybody loves Genesis and Exodus. I wasn't afraid of Lamentations, but I wasn't particularly looking forward to it, either. I didn't have any feelings either way when I opened it up. What I found when I read chapter one of Lamentations was a beautiful, vivid poem about how much sadness there is when God's people have ignored His instructions and leaped (not fallen) time and again into sin. I had read the story in the Historical books, and I read read the warnings in the Major Prophets, and this was the aftermath. I kept thinking about how sometimes I'll tell my kids, "You need to stop doing that or else I'm going to have to punish you," and then they keep doing it and keep doing it, and finally I know that if I don't punish them, I'm going to lose their respect as an authority figure who they need to obey. I've given them the rule, I've outlined the consequences, and I've even given them mercy a time or two, but they've proved that they have an unrepentant heart, and they've brought consequences on themselves. That's what happened to the Israelites, and that's what I read in the first chapter of Lamentations. I stopped after one chapter; this year, because my study environment is still not particularly conducive to long periods of study, I'm not going to push myself. If I get a nice quiet block of time to read, that's wonderful, but I'm happy with as little as one chapter a day if that's all I can get. I'm going to try to be diligent to get that chapter in. One chapter a day won't take me to the end of the Bible by the end of the year, I don't think (I haven't crunched the numbers), but it will get me on track again. Some days I expect to get in more chapters anyway, so I may yet make it by the end of this year. But 2012 or not, I'll make it eventually. And I know that even a little bit of the Word most every day will make a difference. Read it! You'll be glad you did! On Epiphany I blogged that I had a surprise in store for my family to bring Jesus into focus for them this holiday season (if you need to catch up, click here for that post). When I wrote that blog entry, I had a little bit of a problem to overcome: I wanted to share the post with you on the actual day of Epiphany, but I didn't want to let the cat out of the bag on what I had planned! (My wife does occasionally read my blog, you know!) So I simply mentioned that I had something in mind, but didn't say what it was. I wanted to follow up on that and let you know how it turned out! The big surprise was simply that I had gone to the Christian bookstore and picked up a small gift for each of my family members. I wanted it to be something they would like, but I wanted it to be something that would have a spiritual significance to them, and I wanted it to be something that would last them a long time. That's a tricky proposition, especially when you're talking about a 4-year-old girl, but I'm pretty sure the Holy Spirit was guiding me, because everyone seemed to love what I gave them. That evening, without telling them what I was going to do, I had everyone sit down on the floor near the Christmas tree, and I explained that Epiphany is the day to celebrate the arrival of the Wise Men (see my previous post for the whole scoop on that). Then I told them that I've been thinking this season about ways to make sure that we find a way to really focus on Jesus in the middle of all of the racket that's going on this time of year (see this post for more on that!) and that I had gotten each of them something special to remind them of Jesus. Then I began to bring out the gifts, one by one. For my wife, I had bought a small, framed cross, with the words "Trust in Him" written under it; I told her that my hope for her this year is that she would learn even better to trust in God, no matter what is going on. Then I brought out my gift for my 11-year-old son: a book called How To Study Your Bible For Kids by Kay Arthur. Kay Arthur has written a number of successful books on the inductive Bible study method (it's basically what I was always taught, although I didn't know that was what it was called); the book has a storyline and activities and it will be lots of fun for him. And I knew that he truly does care about the Bible and want to know what's in there. Since the book uses the NASB and his regular reading Bible is an NLT (read about his iShine Bible here), I also bought him an inexpensive paperback NASB to use for study times, on the theory that it would be better if he has the translation on hand that the book is written for. I was surprised how excited he was to get it! He loves reading, and I think he's going to have a great time with this book. My 4-year-old daughter was tricker; I wanted her to have something meaningful, and I didn't want it to be one of those cheap plastic Sunday school prize trinkets up by the register. I settled on something that will last her a little longer: I got her a life-sized velvet cupcake with a surprise inside. She opened the package and was so excited when she saw the cupcake, because she loves cupcakes! It's not instantly apparent that something is inside, so I took it and I said, "You can see this cupcake, right?" She said yes. "If it was a real cupcake, you could taste it, right?" She nodded. "Well, the Word of God says, 'Taste and see that the Lord is good!'" 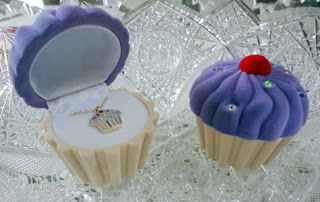 Then I opened it up and showed her the cupcake necklace inside! My wife and I hope to reinforce that Scripture for her every time she wears the necklace until the association is so strong that every time she sees it, she remembers that the Lord is GOOD! A husband can usually tell he has done a good job when his wife winds up in tears. My wife did! And my kids were excited about their gifts too! We told our little girl that she needs Mama's help with her necklace and that it's only for church and very special occasions until she's older; she's already had the cupcake out this morning, ready to wear it to church! I told my wife that I don't intend to celebrate Epiphany exactly like this every year; I don't want it to turn into another day to anticipate getting some "stuff" and another gift-purchasing burden. But I do want to do something every single year, to remind my kids that Jesus is central to our lives. Santa is gone by December 26th; Jesus is here always! What is Epiphany, you may ask? Well, I didn't know myself until several years ago when a friend who is lay clergy at the Episcopal church downtown told me about their church's annual Epiphany service. I knew that the word "epiphany" means a sudden understanding of something, and I had heard that there was a holiday by the same name, but I didn't know what it was all about. For those of you who are from a church background which does not observe Epiphany, here's how it lays out. Remember everybody's "favorite" Christmas song, "The Twelve Days of Christmas"? The one nobody can remember all the words to? Well, it's not just a song! In many religious traditions, there actually are twelve days of Christmas, starting with December 25 and ending on January 5. The next day, January 6, is called Epiphany, and it is traditionally the celebration of the day the Kings from the East arrived to worship Jesus. Interesting that this tradition points out a fact that many Christians are not aware of: the Wise Men almost certainly did not arrive at the manger on the night of Jesus' birth. In fact, not only does the Bible say that the Wise Men arrived at a "house" to see a "child" (not a "stable" to see a "baby"), but it says that Herod, in an attempt to eliminate the new child who threatened his throne, executed male children aged two and younger "according to the time that he had ascertained from the wise men." 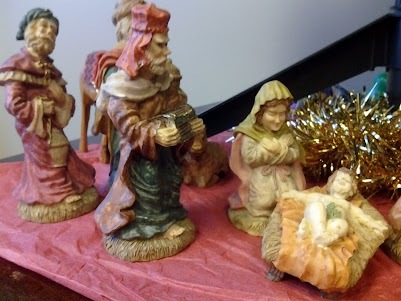 Judging from that evidence, it is possible that the Wise Men arrived as long as two years after Jesus' birth, and that Mary and Joseph had found more suitable lodging by then. The time between Christmas and Epiphany represents the time between Jesus' birth and the arrival of the visitors who had come so far to worship Him. This Christmas season I did a great deal of thinking about how to make sure that Jesus is an actual part of the celebration, not just the statue in the middle of a scene like the one in the picture above. You can read some previous thoughts of mine here. Especially for children, there is so much emphasis on gifts that I started to wonder if there was a way that we could celebrate the festive season with gifts and trees and lights and eating and family and hustle and bustle, but also take some real time to think about the real Jesus. Then I hit on it: Epiphany! It's long enough after Christmas proper that there is some separation from the craziness, but it is close enough that there is still a connection. The manger is still fresh on our minds. Heck, they're still talking about it in my daughter's preschool class at church. So I have something special planned for my family tonight. It's small, but hopefully it is going to be very special and personal, and hopefully it will help us all focus clearly, in ways that we comprehend at each of our own ages (which range from 4 to 41), on the amazing story that not only did Jesus Christ miraculously appear on Earth those many centuries ago, but He is present in the person of the Holy Spirit right this minute. Today. What an epiphany that will be! Want to find out how it turned out? Check here! "Peace," said Jesus. "Be still." You know the story. Jesus was out on a lake in a storm with His disciples, and all Jesus had to do was say those three words, and the storm stopped. The disciples were quite impressed, obviously; wouldn't you have been? Things have been... interesting in my life lately. We've found ourselves in an uncomfortably precarious financial situation, and I've had to bob and weave a bit to keep things running smoothly; at work I've had some complex, high-profile projects which have taken a lot of time and mental energy to manage. Yesterday I figured out a little trick which allowed me to maintain my focus, but today that all got upended by a single phone call, and I found myself feeling anxious and out of control. Pretty embarrassing for someone who, almost exactly six months ago, was blogging about stress! I guess fear can overtake us even when we think we know all about where it comes from and how to avoid it. Boy, what a mess. It's been cold out, but I went outside without my jacket... I needed to take a walk. (Good thing it was a little warmer today than it's been lately!) I started to take a walk around the block, and I wound up taking a walk around several. It did help a little bit, and I was able to finish out the day with some good progress on my project, but I knew I was holding it together with chewing gum and kite string... not a permanent solution. I asked God for some help, for a little insight, but I really got nothing. I've learned that usually when God doesn't answer your question, it's either because you already know the answer, or you don't really want the answer in the first place. I knew I really wanted the answer, but for the life of me I couldn't figure out what it might be. Luckily, I had a pretty good idea where to get my balance back: Encounter Night. Luckily, tonight was Encounter Night. We have it at my church on the first Wednesday evening of every month; it's a service where we spend just about the whole time worshiping God with music. There's no formal message, although we do usually take communion. 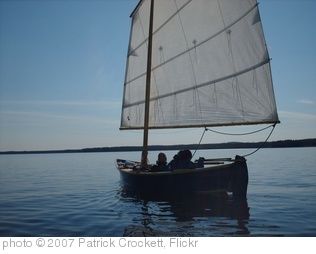 I went in needing something, and sure enough, by the time I left, I had found what I needed to persevere through the next steps of my work project and my financial commitments. But it wasn't quite what I expected! Several weeks ago I blogged about storms. Actually, though, that post is more about one particular type of storm: it's about the kind of storm that is bringing the answer to a problem, but which makes it look like things are getting worse before they are getting better. That kind of storm is uncomfortable, but it is actually from God; like digging the bullet out of a wound so it can heal properly, it seems like the pain is getting worse, but the suffering actually causes the situation to improve in the long run. The storm I was experiencing today was not that kind of storm. It was primarily an emotional storm, something raging more on the inside of me than the outside. This was a storm of fear, not a storm of circumstances. This was not a storm of God. This storm had to go. But how was I going to get rid of it? Recently I was reading a book that mentioned that being a disciple of Jesus means trying your best to know Him so well that you think and act like Him, react to situations like He did. As I stood there worshiping tonight in Encounter Night, I realized what it is that Jesus did that I needed to do. I needed to speak to this storm. I needed to tell it to Be Still. I'm not Jesus and I can't stop either a rainstorm or an emotional storm, but I can speak out in faith, in imitation of Him, and I can trust God to be the one that calms the storm. The storm of circumstances might or might not let up immediately, but when I speak to the storm of fear inside of me, believing that God can calm that storm, I know He will. At the right time, the circumstances will resolve themselves too, but from now until then, I'm speaking to the nor'easter when it blows up inside of me, and I'm trusting that God will bring it to a peaceful calm.